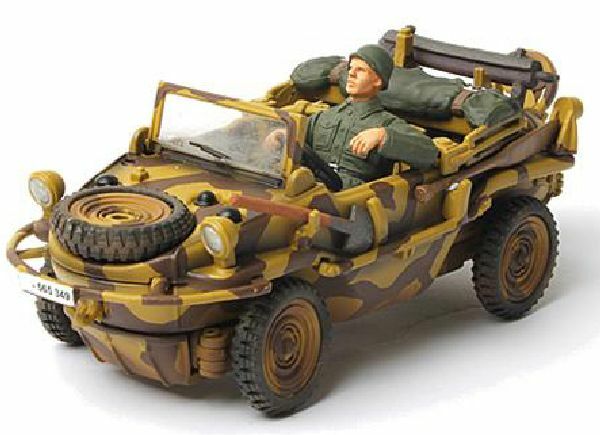 This is FOV82002 German Schwimmwagen Type 166, Normandy, 1944 from Forces of Valor. This is FOV82002 German Schwimmwagen Type 166, Normandy, 1944 from Forces of Valor. German Schwimmwagens used the engine and mechanicals of the VW Type 86 four-wheel drive prototype of the Kübelwagen and the Type 87 four-wheel drive 'Kübel/Beetle' Command Car. From 1941 through 1944 a total of 15,584 Type 166 Schwimmwagen cars were produced. Given these numbers, the Type 166 is the most mass-produced amphibious car in history. Only 163 are known by the Schwimmwagen Registry to remain today, and only 13 have survived without restoration work. The Forces of Valor® replica is of a Type 166 as seen in Normandy in 1944. Upper and lower chassis is metal.